AVID, Advancement Via Individual Determination, is a college readiness system that is designed to increase schoolwide learning and performance. 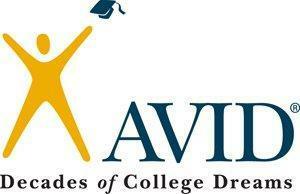 Developed in 1980, AVID has a proven track record for challenging students in the “academic middle” and providing them with support to reach their college goals. Students “in the middle” are typically hard workers who have the desire to go to college and are capable of completing rigorous classes but are falling short of their potential. Students must apply and become accepted into AVID. Each AVID campus has an application and interview process. The AVID elective class, an important element of the AVID system, is a requirement for every AVID student. Students in AVID take some of the school’s most difficult classes, including Pre-Advanced Placement, dual credit, and Advanced Placement. During the AVID elective, students learn study skills, organization, critical reading and writing, note taking and critical thinking skills, such as how to develop and ask probing questions. Students collaborate to help each other understand difficult school work. College students, who are role models, facilitate tutoring sessions at least twice weekly during the AVID elective. Tutors receive formal training in the AVID system. The AVID system is in use in All Sheldon Secondary Schools and most Elementary School. Teachers and administrators on AVID campuses attend professional development, where they learn strategies for helping students. This permits all students to benefit in content-area classrooms. AVID tutors facilitate student success in academics and college readiness. They also demonstrate strength in the areas of math, science, and/or English; Pre-AP or AP course experience. For more information about AVID, contact the AVID District Director or the Campus Site Coordinator.